This product is delivered via digital download in a ZIP folder with OBJ and FBX format files saved for each group of objects. The set includes: Chairs, Couches, Tables. 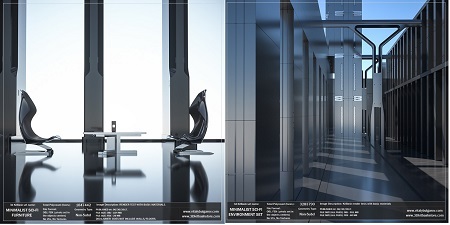 DISCLAIMER: Walls, Floors and Pillars are NOT included and are sold separately as part of Minimalist Sci-Fi Environment Set. Please note also, that the preview images show these models rendered in Octane Render Standalone as tests only and the delivery files DO NOT include Octane Scenes or Octane Materials. This product is delivered via digital download in a ZIP file that contains 3D Geometry in 2 Scenes in OBJ and FBX format.